Today I met Backwatersman at Grace Road, Leicester, to watch the third day of Leicestershire vs Sussex. 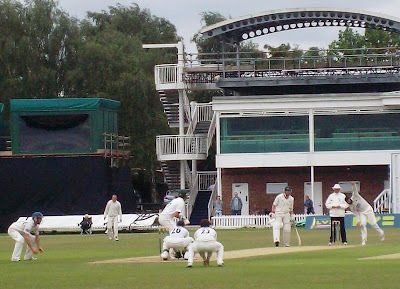 I arrived after lunch, having called in at Lyric Lounge first, and was able to watch Leicestershire lose their last five wickets and succumb to an innings defeat. Most of the damage was done by Corey Collymore, who appears to be known as "Screws" to his teammates - perhaps it is better not to ask why. 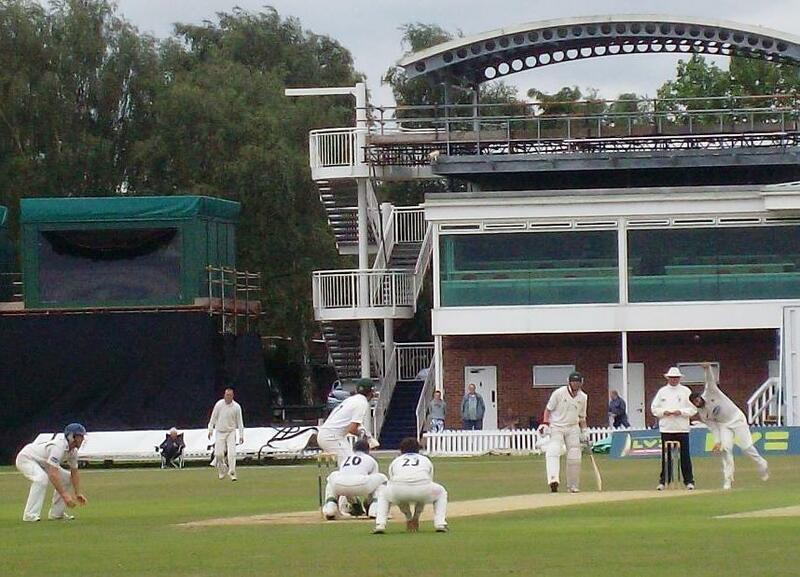 But my photograph shows Monty Panesar bowling to Nathan Buck. Nick Clegg's scandalous great great aunt gets a mention into today's Guardian. Of [Graham] Greene's female cousins, Barbara Greene emerges as the most intriguing. Berkhamsted-educated, she was friendly with Baroness Moura Budberg, a Russo-Estonian exile living in London (and mistress, among others, of HG Wells). Another interesting character is Raymond Greene, one of Graham's elder brothers. Thomson claims that he conquered Everest in 1933, which would have been news to Edmund Hilary and Sherpa Tenzing. he enjoyed obstetrics and, years later, took a retrospective pride in having delivered Antonia Fraser. Paul Crossley reports a "political earthquake" in North East Somerset, where the Liberal Democrats gained seats in local by-elections in Keynsham and Radstock. It is striking that, 40 years after the closure of the Somerset coalfield, the Tory vote remains so low in the latter town. The Chartists would have been all in favour of equalising the size of constituencies, as Stephen's Liberal Journal reminds us. "Anti-Trident campaigners should today be lauding George Osborne," argues Decline of the Logos. But then the economic arguments against Trident was always likely to prove the most persuasive. Classical Greek is being taught to primary school children from deprived backgrounds to improve their English, reports TES Connect. Labour MP Andy Love has been to the unveiling of a series of mosaics celebrating the music hall star Marie Lloyd. 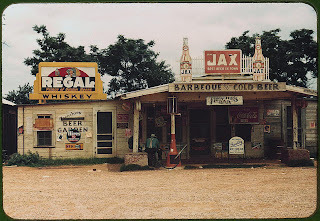 The Denver Post has some wonderful colour photographs of American life between 1939 and 1943. I have borrowed one of them here. An 11-year-old boy has been excluded from school after brandishing a knife in front of horrified fellow pupils. The boy was found with the knife while on a school bus which was parked at Uppingham Community College waiting to take pupils home to villages in the north of Harborough district, including Skeffington, Tilton on the Hill and Tugby. "Children on the bus were absolutely horrified by it. 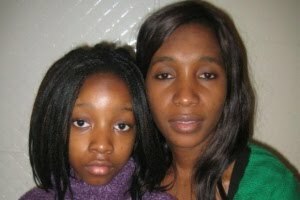 My children came home frightened to death. "There are a lot of worried parents as a result of this." That is until you read a little further. The knife turns out to have been a "a one-inch antique fruit knife" and the head teacher is reported as saying the boy did not have a malicious intention. It is hard to see why anyone should be horrified or even particularly worried by a minor incident that has been dealt with by the school and the boy's parents. It is hard to see why it is a news story at all , though it would be unfair to be too hard on the Harborough Mail: this is a national malaise. When I wrote about our exaggerated concern about children and knives in House Points back in 2005, I received an email from an American saying that Scouts still carry knives over there and no one worries about it. So perhaps this is a particularly British disease. This week's heartfelt, if disgustingly loyalist, House Points column from Liberal Democrat News. World Wide Words has a short article on these Dutch expressions. Interestingly, it seems that the one you hear most often today - "Dutch auction" - originally had no pejorative sense but has acquired it by association over the years. The English language embodies our history, and there is a little group of expressions that remind us of a forgotten corner of it. ‘Dutch courage,’ ‘Dutch treat’ and ‘Dutch concert’ were all coined in the latter half of the 17th century when we were fighting wars with the Netherlands and naturally forming a dim impression of our enemy’s characteristics. Today, as the Commons has shut down for the summer, I am going to evoke another of those expressions and write like a Dutch uncle. Because what I want to say is this: enjoy being in government. Not just because we had all grown rather tired of the alternative. And not just because it is great to see people like Nick Clegg, Chris Huhne and Vince Cable in the cabinet where they belong. Enjoy it because of the progress we are making in the areas we care most about. On reform of government we have a referendum on the Alternative Vote, fixed-term parliaments and moves towards an elected second chamber. On education we have the pupil premium to direct extra spending to benefit poorer children. And on liberty we have measures like the abolition of identity cards, their accompanying database and the ContactPoint Database of all the nation’s children (brought in lest someone blame the Labour government for something one day) too. We should also enjoy being in government because it was always going to be like this. For generations Liberals and the Liberal Democrats have been a third party campaigning for electoral reform. We were bound to get our first taste of government in the modern era as the junior party in a coalition. So you have to ask those Lib Dems who are feeling disaffected what they thought government would be like. And if you still feeling unhappy with government, do please make sure you are not suffering from an inferiority complex towards Labour. It is no part of Liberalism or Liberal Democracy to defend every quango and every pound of off-balance sheet spending by the last government. It is time to lose the cringe. While I was writing this it occurred to me that our leader probably has a Dutch uncle. So perhaps Nick will appreciate this column. You have until midnight on Saturday (31 July) to vote in this year's Total Politics poll. You MUST include at least FIVE blogs in your list, but please list ten if you can. If you include fewer than five, your vote will not count. Email your vote to toptenblogs@totalpolitics.com. Only blogs based in the UK, run by UK residents or based on UK politics are eligible. No blog will be excluded from voting. All votes must be received by midnight on 31 July 2010. Any votes received after that date will not count. Any votes for Liberal England will be gratefully received. A north London grocery store is committing "wildlife massacre" by selling squirrel meat, an animal welfare group has claimed. Vegetarians International Voice for Animals (Viva) accused a branch of Budgens of supporting a "barbaric and needless cull" of grey squirrels. 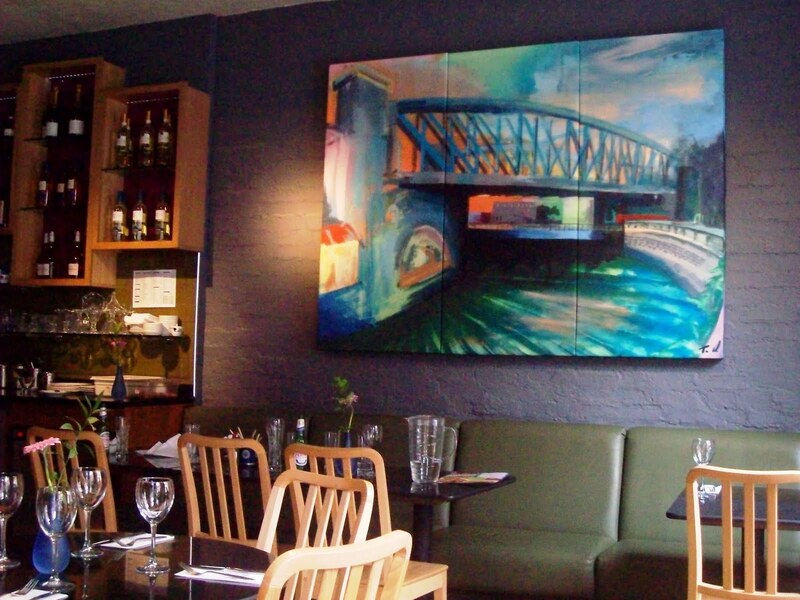 An independently-owned branch in Crouch End has been selling the meat for four months. I think Viva is barking up the wrong tree here. There is far more cruelty involved in the factory farming of more conventional animals than there is in killing squirrels. 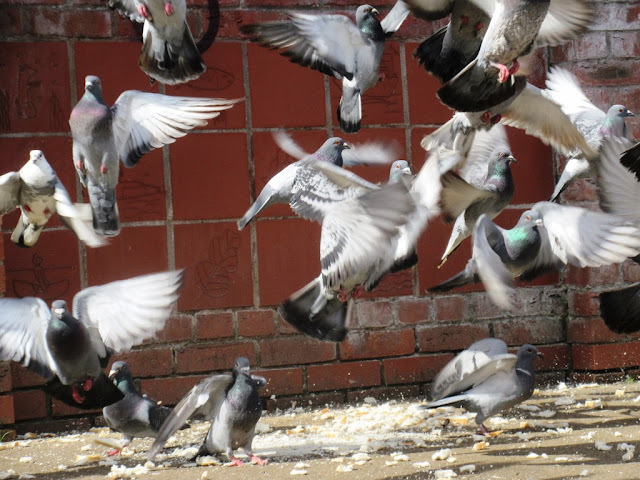 They have a happy time leaping from bough to bough and playing with their nuts until their final moments. No doubt Viva campaigns against factory farming too, but the outrage here is misplaced. "What gruesome product will be next to grace our food aisles? Blackbird, field mouse or mole?" she merely confirms that actors are usually more impressive when someone else writes their words for them. Still, I suppose the advantage of electing yourself the voice for animals is that they are never going to turn round and say: "Don't patronise us, whitey." A little bit of local cricket history on The Corridor. Later. My post on The Corridor has long since vanished, but here is the Leicester Mercury report of the day's events. Another video combining vintage railway footage with a contemporary soundtrack. This one combines film taken in and around King's Cross station in the 1950s and 60s with Pick of the Pops from 28 May 1960 and 18 July 1963 as an accompaniment. It is interesting to see what a mess the area in front of the station was in those days. In the 1930s there was even a new house standing there, built to advertise new estates that could be reached by train. Thanks to Londonist and BritishRailways.tv. Even if you don't share my obsession with Steve Winwood, you have to admit that Traffic's Paper Sun is one of the great singles of the psychedelic sixties. When the makers of the Brian Jones biopic Stoned wanted a song on the soundtrack to accompany his visit to Marrakech, it was Paper Sun that they chose. There is a video of Paper Sun on Youtube that shows the band walking round a museum - I have included it above. The general view on the web seems to be that the museum in question is the Horniman Museum in Forest Hill. I have propagated this theory myself. we've just been looking in the galleries that were here in 1967 and the floor and windows seem too different. Quex turns out to be the Powell-Cotton Museum at Quex Park in Kent. Compare the video below with the one for Paper Sun and you will see that the Horniman people are right. A musical mystery solved. Two years later. Or is it? The people at Powell-Cotton Museum say it was not filmed there. A bit later than that. Thanks to the comments from Slugabed below, I have solved this mystery. Coming home from Leicester on Sunday I decided to walk home the pretty way. This involves going along Glebe Road, site of the former brickworks and now home to the Welland Valley Vintage Traction Club. Even before I got there I could tell they had an event on. I was passed by a steam lorry and a couple of vintage tractors. When I got to Glebe Road I found it was the second day of the club's open weekend. I had a cup of tea and admired the vehicles collected there. A Timely Reform looks at the questions BBC2's Newsnight failed to ask - in case the answers spoiled the piece knocking the Lib Dems that they presented last night. 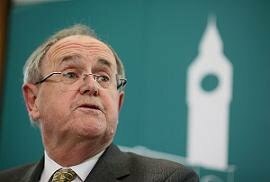 Sir Alan Beith is interviewed by Total Politics: "There are a lot of Labour's laws that I would like to repeal. They became rather like a nanny state. Very authoritarian party and created supposed anti-terrorism legislation which was only used in situations which had nothing to do with terrorism." Millennium Elephant offers nine good things about saying yes to AV. "Last night I had the 'pleasure' of being detained against my will not by the police but by Rail Enforcement Officers who operate on the South Eastern rail services. What did I do wrong? I took a picture of these Rail Enforcement Officers and when they asked me to see and then remove the pictures from my phone I refused." The experience of You've Been Cromwelled shows that photographers are still being harrassed and that our public spaces are now peopled by all sorts of people in uniform whose claim on the authority they exert is questionable. 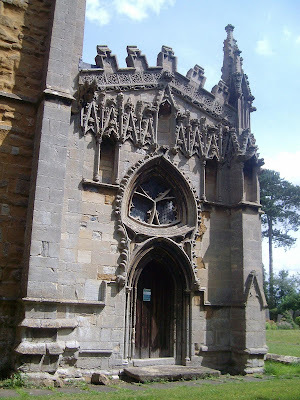 As someone has kindly nominated my post about Gaddesby church, I had better direct you to this week's Britblog Roundup and Mr Eugenides. Fred Inglis, writing for Times Higher Education, celebrates "the massive continuity of organisations such as the Brownies, the Women's Institute, the parent-teacher associations (it is the women who save us), the trainspotters, the vintage car enthusiasts, the utterly admirable legions of the RSPB, recently and lovingly apotheosised as 'Swallows and Anoraks'." Kentish Town baths: "Like swimming in St Pancras station"
"It's the most exciting thing I've ever done since having two children. I'd spent 20 years in opposition, and until this project my crowning achievement was getting a bench put in by a bus stop." Writing on Liberal Democrat Voice, Helen Duffett announces the opening of nominations for this year's Lib Dem Blog of the Year Awards 2010. See Helen's article for the details on how to make nominations. She writes: "Please don’t feel the need to round up hundreds of people to nominate your blog as the number of nominations aren’t taken into account." Having despaired of ever winning one of the damned things, I have agreed to be a judge for this year's Awards. One of the highlights of the canal holidays we had when I was a little boy was Midland Counties Ice Cream. 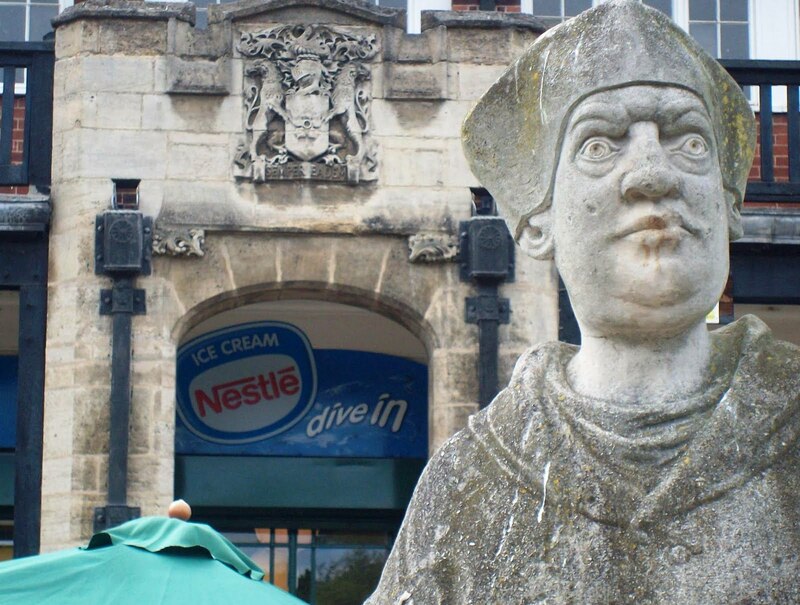 In Hertfordshire it was all Walls or Lyons Maid, but further north they had a different company with different lollies. 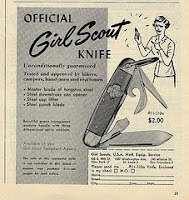 This television commercial must come from about the same period. Ten bonus points to anyone who recognises the canalside location, because I can't. There is a video on the Guardian website explaining the online tools the paper has created to help readers understand the files. You may remember - how could you forget? - my coverage of the unsuccessful campaign to prevent the city council and De Montfort University demolishing Leicester's Bowstring Bridge. Today I had lunch in branch of Pizza Express in King Street, Leicester. And look at the painting they have on the wall. Across the road the City Council's offices, housed in two speculative blocks it bought in the 1970s, are in a bad way. As I looked out during my meal, I hoped they would shudder and collapse. going the same way as the bridge. The Real Blog calls for a Big Society or Co-production Guarantee to enshrine the coalition’s rhetoric. It would "back innovators against bureaucracies, and would back local against the centre. But it would also back local people against streamlined corporate power." If you like football then you may want to join the unofficial Lib Dem fantasy premier league, says Chris Wilson on Liberal Democrat Voice. Writing from Tallinn, Cicero's Songs draws a worrying comparison: "Estonia is a genuinely flexible market - and the UK is not. Estonia, with relatively low levels of total debt and extremely low levels of government debt- less than 9% of GDP - is not carrying the burden of unfunded pension liabilities that is crippling the UK." 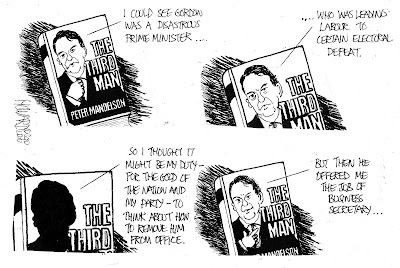 Max Atkinson compares the Labour leadership candidates' communication skills. "Large parts of the Conservative party that runs local authorities up and down the country ... [are] reactionary, authoritarian and 'tough on crime' for the sake of being 'tough on crime' to the point of bringing great detriment to local communities and personal freedoms," argues Hypnotic Monkey Business. 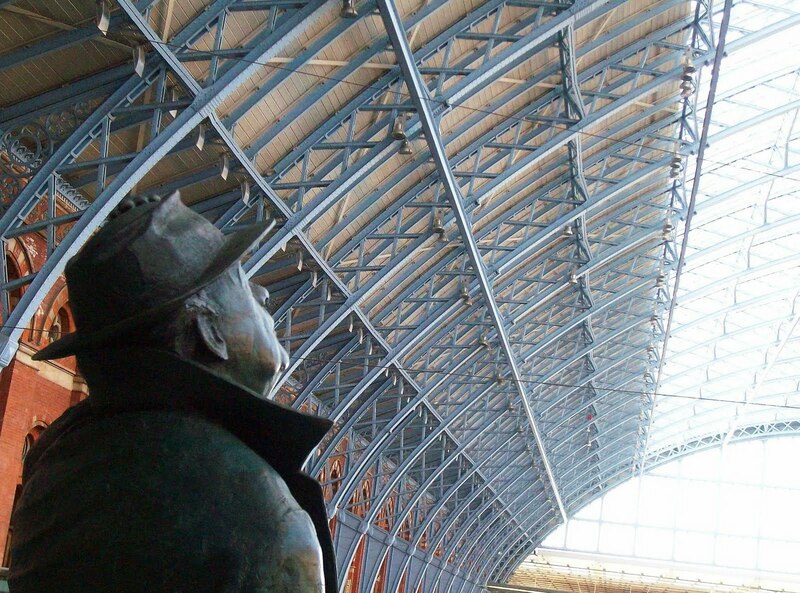 English Buildings, one of the blogs that has most influenced this one, celebrates its third anniversary at St Pancras station - where I took this photograph. There were some good things about the singles chart in the 1970s, and Steely Dan was one of them. We are used to hearing their immaculate, so-cool-it-hurts studio recordings. Here, playing live, they have a looser feel, like an American Traffic. Quite why this is seen as an important news story, I do not understand. But well done to Nick Clegg for handling it so capably today. What I do know is that to observe that two men like each other and work together well and then say, in effect, "hur, hur, hur, they must be gay" is cheap and ignorant. That is "ignorant" as we use the word in Leicestershire. The person referred to is ill mannered as well as ill informed or ill educated. In this case I suggest this observation comes from frustrated ambition. For no very obvious reason Davis has convinced himself that he ought to be Tory leader and holds a grievance against David Cameron as a result. Still, Harriet Harman makes similar cracks about partnerships and marriages every time she leads for Labour at prime minister's questions. So being the niece of a Countess is no guarantee that you will not be cheap and ignorant. Last year I visited to Rushton Triangular Lodge. I was back in the village again today. 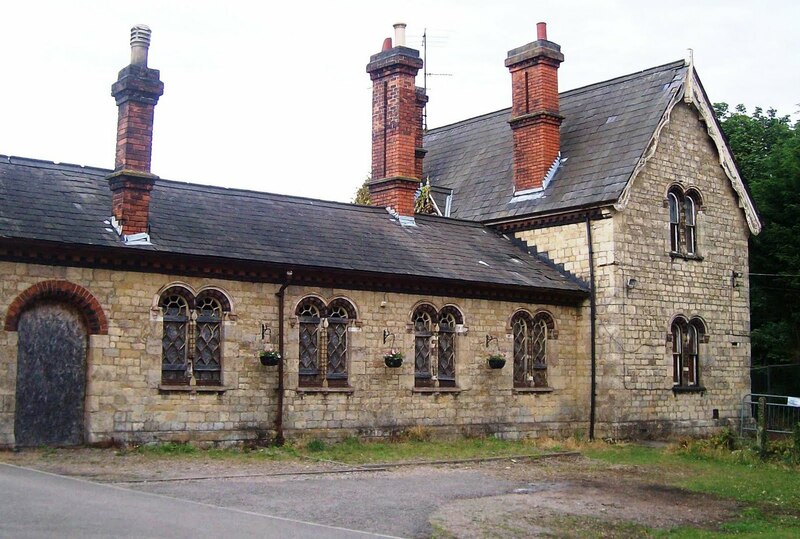 This is Glendon and Rushton station on the Midland mainline between Market Harborough and Kettering. It closed a few weeks before I was born. Wikipedia says the station opened in 1857 as Rushton - unsurprisingly, as it is right in the village. It was renamed in 1896 to avoid confusion with the larger Rushden, which is also in in Northamptonshire. Amid the recriminations over the release of Abdelbaset Ali al-Megrahi and the rumours of BP's involvement, we should not lose sight of the central question. This essay by Gareth Peirce from last year's London Review of Books presents an eloquent statement of the reasons why we might conclude that he was not. 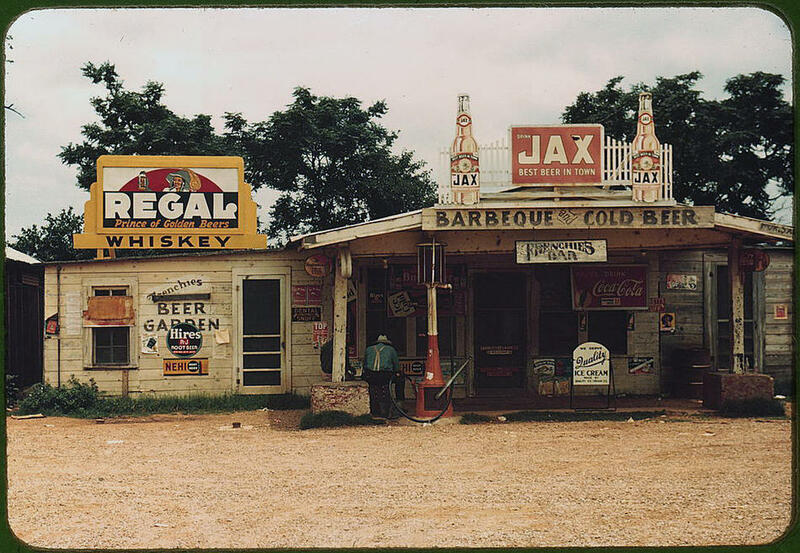 I have just posted a roundup of recent posts on The Corridor. You wouldn't know it from the mainstream media, but yesterday was a good day for the Liberal Democrats in local by-elections - a gain in Torbay and several holds elsewhere. Helen Duffett has the details. Conservatives are more open minded about electoral reform than you might think, says our new friend Edward McMillan-Scott on politics.co.uk. Big Think has some essential summer reading on environmental politics. The Lord Chief Justice has allowed appeals in two criminal cases where Crown Court judges made orders that they should be heard without juries, reports Solicitors Journal. Good news for all who believe in trial by jury. The northern navigable reaches of the Yorkshire Derwent are explored by narrow boat on Epiphany blog. Film Studies for Free has a wonderful list of web resources on Englishness in cinema. 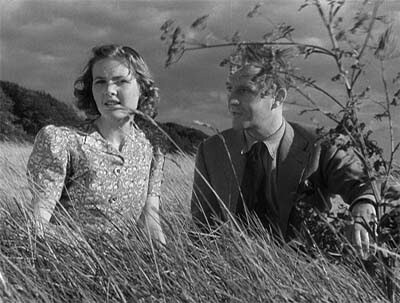 Our illustration shows Sheila Sim and Eric Portman in the most English film of all: A Canterbury Tale. You can find more videos on the Scottish Liberal Democrats website. Philip Hollobone is the Sharon Hodgson of the Conservative Party. We have heard from him before, calling for Kettering to become to volleyball what Wimbledon is to tennis. And we have seen him interrupting a fraught prime minister’s questions on the death of Baby P (Peter Connelly, as we can now call him) to ask Gordon Brown to encourage more children to take up the ocarina. Now Hollobone is in the headlines for real. He has announced he will not talk to women constituents who wear full Islamic dress. And he intends to move a bill that would make it illegal for people to cover their faces in public. It is easy to laugh at Hollobone, though not easy to laugh enough. He is not quite the man who put the berk in burka, and certainly not the one who put the IQ in niqab. We Liberal Democrats, of course, believe people should be free to wear what they want. We could just about stomach Jack Straw’s practice of asking Muslim women to remove their veils when they met him because we knew they were free to refuse. But before we congratulate ourselves on being so liberal here, let’s enter a couple of buts. The first is to point out that what people wear often tells us something about society. Yes, the hoodie has been demonised, but where it represents an arms race between security cameras and youths it brings us unwelcome news. Maybe it also tells us how much effort teenage boys in some communities have to invest in not catching the eyes of other teenage boys. And the second is to remember the central place that dress reform once played in radical politics. In the 19th century it was an important movement that aimed to free women from the confining and even crippling fashions that held them back. Radicals then did not shrug, say it was “part of their culture” and move on. The moral is that we should not fall into the Labour (and often backbench Tory) habit of wanting to ban everything of which we disapprove. But nor should we abandon our principles out of a fear of being seen as racist. If we think something is wrong we should say so. The Daily Telegraph is the clear winner of Headline of the Day. We were tempted to award Comment of the Day to the spokesman for English Heritage for his: "This was a very rare incident". But are we sure he is right? Could he be living in a fool's paradise? I once confessed that every time I hear Mr Karzai, the President of Afghanistan, mentioned, I think of Kenneth Williams as the Khasi of Kalabar in Carry On... Up the Khyber. 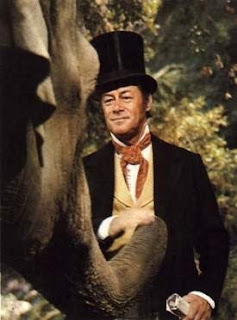 Equally, whenever someone says we should "talk to the Taliban" I think of Rex Harrison singing "If I Could Talk to the Animals" in Dr Dolittle. I went to see it because of another incident in Edward Cheney's life. He was one of the two Liberal candidates for the Southern Division of Leicestershire - the seat that preceded the Harborough constituency - at the general election of 1841. His fame did not help him: the two Tories were elected and Cheney finished bottom of the poll. 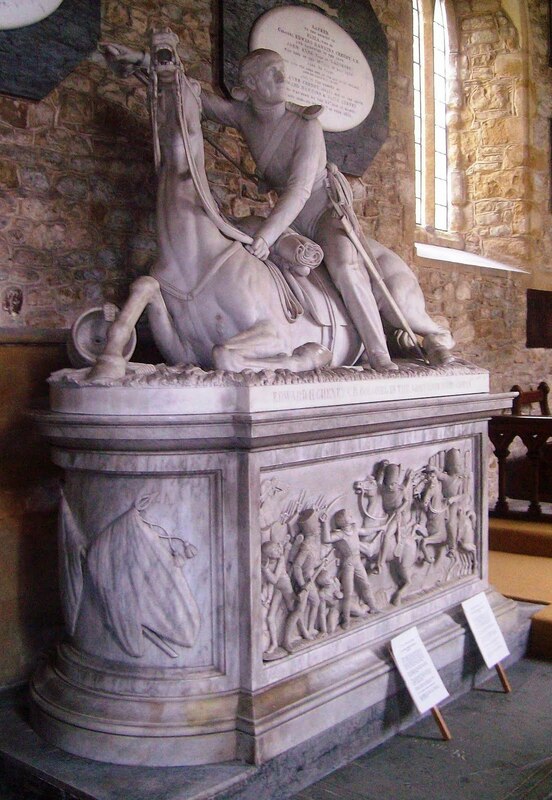 His statue originally stood in the neighbouring Gaddesby Hall and was moved to the church in 1917. As Pevsner said, it is "of a type more suited for St Paul's Cathedral than a village church". The notice that explains its presence to visitors claims it is the only equestrian statue in an English church. The Colonel is hidden away in the dark chancel: the rest of the church interior is light and a little rough. And the locals do their best to make the statue more homely: the horse's teeth are blackened from the apple that is put in its mouth at harvest festival each year. The Harborough Museum has added more old photographs to its Flickr account. There is now a set of photos of Little Bowden, including one that shows there used to be a footbridge beside the level crossing on Scotland Road. The signal box in that picture, by the way, is the one now to be found at Pitsford and Brampton on the Northampton & Lamport Railway. There is also a set of photographs of Bricky Tip. Several of them show the houses in Bellfields Lane or the railway, so it should be possible to work out exactly where they were taken. Bricky Tip, now called Windy Ridge, has been threatened with development for some years. The site of the other former brickworks and associated quarry in Market Harborough is now occupied by Symington's Recreation Ground. When I was a councillor and we were getting the town's leisure centre built, this was one of the locations we considered. But the consultants were adamant that you never know what you will find when you start digging foundations in an area like that, so we disregarded it as a site. I wonder if the would-be developers of Bricky Tip know what they are doing? Later. I have found a picture of Little Bowden Crossing signal box taken in 1972 when it was still in situ. It was known as Little Bowden Crossing to differentiate it from Little Bowden Junction on the Midland line to St Pancras. It is is worth reflecting for a moment on what an historic day it has been. A Liberal Democrat answering Prime Minister's Questions is something I thought I would never see. The press, of course, are on the hunt for gaffes, but I think Nick did just fine. And, whether calculated or not, his answers on Iraq and Yarl's Wood will have done much to rally his party behind him. And Labour has also been complaining today about the Coalition's approach to Afghanistan. As I understand it, Labour are angry that we appear uncertain exactly how we are going to extricate the country from the terrible mess that they got us into. All this, and Australia were bowled out for 88 at Headingley too. Nick Clegg stood in at prime minister's questions today. Nick Thornsby's Blog was impressed: "I thought Nick Clegg handled himself extremely well, looking reasonable, intelligent and fluent. Jack Straw proved a difficult opponent, though not because he scored some big hits against Clegg. Frankly, Straw’s line of questioning was just plain weird. He went on for far too long on some technical points that, if we’re honest, nobody really knows or cares much about." Jonathan Wallace was not impressed by Her Majesty's Opposition: "Labour ... are completely obsessed with having a go at the Lib Dems, to the exclusion of the issues that matter to most people. It makes them feel good to be beastly to the Lib Dems but its not the sort of behaviour that will give them victory at the general election in 2015." 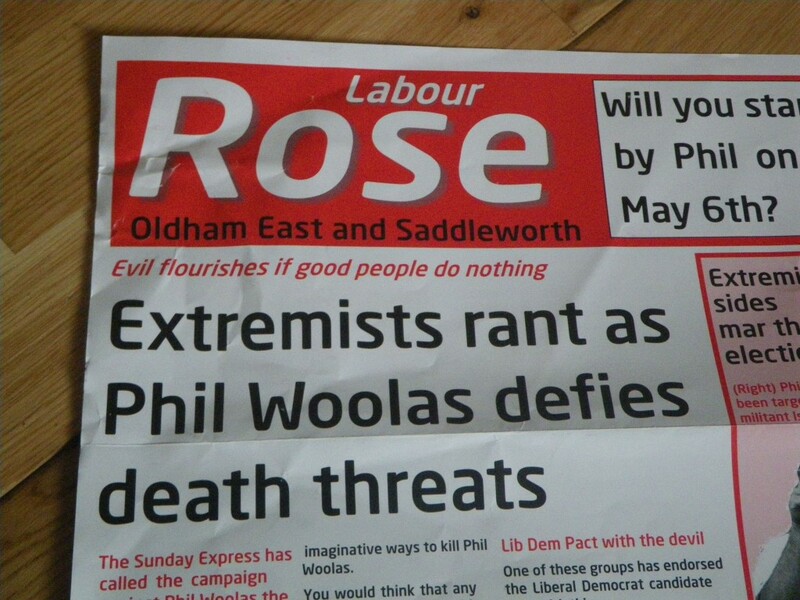 "The future of Phil Woolas as Saddleworth’s MP will be decided by an election court in less than two months’ time. It was revealed today that two High Court judges will travel to Oldham for five days of hearings, beginning on Monday 13 September." Read all about it at Saddleworth News. The blog Save Bray Studios has been set up to prevent the destruction of the former home of Hammer Films. Random Blowe brings news that tomorrow the Director of Public Prosecutions will announce whether any police officer will face criminal charges over the death of Ian Tomlinson. And also news of a demonstration in support of Tomlinson's family. The current Leicestershire Festival of Archaeology is covered by Culture 24. It's that time of year again, when Total Politics asks you to vote for your Top 10 favourite blogs. This is the fifth year of the poll. The votes will be compiled and included in the forthcoming book, the Total Politics Guide to Blogging 2010-11, which will be published in September. For the second year running, the poll is being promoted/sponsored by LabourList and LibDemVoice as well as this blog, and that of our publisher, Iain Dale. You have until 31 July to vote. Many thanks to anyone who includes Liberal England in their list. Lord Bonkers adds: Remember, your rents fall due on Lady Day. Earl Shilton is a fairly nondescript village in Leicestershre best known as the nursery of a brace of seam bowlers with two-test international careers - Les Taylor and Jimmy Ormond. But in 1959 and 1960, suggests this startling film from the British Pathé collection, it was in the headlines for a different reason. This film - click on the photo above to be taken to the clip on the British Pathé website - shows the return home to Earl Shilton of 12-year-old Tony Stephens after having been kidnapped and kept on the Continent for 15 months. The commentary says that the boy's father, a milkman, gave up his job and searched Europe for him and the film shows an art master, Kevin Tracey, being taken off to Hinckley to be questioned. This is the first I have heard of this affair? Was it the talk of the country in 1959 and 1960? A search of the net produces only a posting on an Earl Shilton forum and, from it, a cutting about Kevin Tracey appearing in court. While writing this, I have also come across a cutting from the Straits Times about Tony being found by his father. (Pathé gives the boy's surname as Stevens, but both newspapers have it as Stephens.) It would take a search of the contemporary national press - or at least the Leicester Mercury - to see how big a story this was. What is striking about the newsreel now is that Tony's return home is treated as an uncomplicated good news story. There are no experts on hand to talk about trauma, even if the likely motivation for the kidnapping must have been just as apparent then. Notable too is the lack of privacy for the family and - if this film shows the real return home rather than a reconstruction of it for the cameras - and the lack of journalists outside the house. Of course, things may not be quite what they seem. I have heard it said that you must assume that all documentary footage from the Second World War is staged for the camera, because in those days a mobile film unit was so large and unwieldy. I do not know how far things had moved on by 1960. Later. The Needle has posted some of the press coverage of the resultant trial. For three days and three nights, New Walk Museum will become Lyric Lounge Leicester! A whole range of free activities will run from 10am until 10pm and take place across the museum. In the day, chill out with coffee, tea, books and films, draw with festival artist in residence - Tim Clarke, or choose from an impressive host of poetry workshops and happenings - from ‘Get Stuffed!’ to ‘The Decadent Romantics’ and the amazing ‘Combust Circus’ company. Be entertained with music and poetry over ‘Lyrical Lunchtimes’ and mid morning ‘Bites’, chat to The Book Doctor, or take to the mic yourself. In the evening catch everything from WORD! with Mark Gwynne Jones and the Psychicbread, to John Hegley - The Godfather of performance poetry. John will be performing his brand new show, ‘The Adventures of Monsieur Robinet’ - against a back drop of museum objects. With a line up that includes poetry from the internationally acclaimed, Jean ‘Binta’ Breeze and music and lyrics from the likes of Kenny Wilson, Mike Sole and ILUVLYRICS, ‘Lyric Lounge Leicester’ invites participation from people of all ages and is definitely not to be missed. The Lyric Lounge will also come to Nottingham and Loughborough later in the year. Not Eaten by Missionaries after all? Iain Sharpe has started blogging again at Eaten by Missionaries. Longstanding readers will know that my favourite writer as a child was Malcolm Saville. His books are where my love of the Shropshire hills first came from. "The country in which this story is set is real, but if you are ever lucky enough to explore it for yourself you will not find Witchend." Up to a point Lord Saville. If you do explore the Shropshire hills with an Ordnance Survey map and the maps you find on the endpapers of the Lone Pine books, you will soon discern that the real-life model for Witchend is a house called Priors Holt. Equally, you will discover that the Ingles Farm of the book is based on Hamperley Farm down the lane. When making these discoveries you will probably also come across the Longmynd Adventure Camp - just the sort of establishment of which Malcolm Saville would have approved. A south Shropshire adventure camp, set up 50 years ago, is enjoying its busiest years ever – but supporters fear the credit crunch could hamper plans to finish refurbishment work. The Longmynd Adventure Camp ... has had its busiest half-year ever. “It’s extremely heartening to see the camp being used by more groups of special needs children. Once our wheelchair path opens in early August we plan to welcome even more.” said president Don Rogers. A massive £36,000 fundraising drive has reached the half way total. but trustees still need to raise another £18,000 to complete the refurbishment of the camp’s mess hall. The article goes on to give contact details, should you feel moved to donate to the camp. Andrew George, Lib Dem MP for St Ives in Cornwall, is campaigning against unfair banking charges:"It is not unusual for bank customers to find themselves hundreds of pounds overdrawn within a few weeks of initially straying just a few pence overdrawn. Such abuse by high street banks which were themselves bailed out by poor taxpayers is morally unacceptable." Caron's Musings contrasts officialdom's treatment of Raoul Moat and of Florence and Precious Mhango. The Big Society is just an admission that the state can't do everything, says Tory councillor James Cousins. Congratulations to Labour-run Tameside on finding a new way of wasting public money. The Manchester Evening News reports that it has blown £36,000 on creating a "virtual town hall" in Second Life. History Today mourns the fact that less than 30 per cent of schoolchildren take history at GCSE: "Apparently, it is seen as a difficult, academic subject, a stigma it shares with the separate sciences and modern languages (i.e. the very subjects that make one educated)." The magazine's blog has harsh words for the cult of "relevance" too. I was too busy in Gaddesby to get to the English Heritage Festival of History at Kelmarsh Hall last Saturday. But it doesn't matter: Unmitigated England was there. "Maybe it's the shape of the missiles but every time Trident is mentioned there is an outbreak of priapism on the Tory backbenchers. There is a real risk that the whole strategic defence review will be skewed because of the obsession with Trident. It makes no sense whatsoever to exclude Trident, the strategic deterrent, from a proper strategic review." I went to Gaddesby on Saturday to photograph its remarkable church, but I was also struck by the village's dry brick walls and their distinctive herringbone pattern. 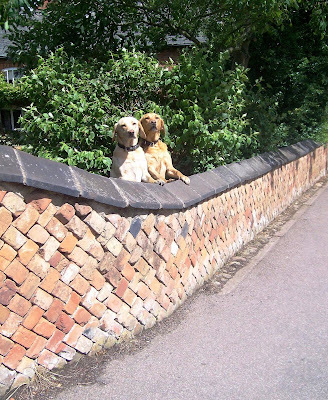 Later that day I saw a short stretch of similar walling in the nearby village of Twyford, but I cannot recall having seen it anywhere else. As you can see, the natives in Gaddesby are friendly. Recent mentions of the attention being paid to the election expenses of Zac Goldsmith in Richmond and of Adrian Slade inevitably put me in mind of this story. In 1981 Adrian Slade won the Richmond seat on the Greater London Council for the Liberal Party, defeating the sitting Conservative Edward Leigh in the process. The Conservatives then lodged an election petition, contesting the result because of technical errors in Slade's return of expenses for the contest. The process, however, left Adrian facing ruinous legal expenses. His friends rallied round and staged An Evening At Court on Sunday the 23 January 1983 at the Theatre Royal, Drury Lane, to help him raise the money. As Smarter than the Average! tells you in exhaustive detail, many of the greats of British comedy performed that evening. I moved down to Richmond a month or two after that, and it is fair to say that because of this case relations between the Liberals and Conservatives were not exactly warm. The current attention being paid to victorious candidates' returns of elections expenses is unlikely to end well for anyone in the long run. But I have a good memory and find it hard not to enjoy Zac Goldsmith's discomfiture. On the way into work this morning someone gave me a reproduction of the 1899 Ordnance Survey map for Market Harborough. I expect it happens to you all the time too. 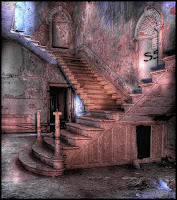 I have found lots of minor points of interest to investigate, but two major ones stand out. And it turns out that the brickworks in the photograph I recently posted was not on Windy Ridge but on the other side of Glebe Road. It must have been on the land now occupied by the recreation ground and the premises of the Welland Valley Vintage Traction Club. Windy Ridge used to be known as Bricky Tip, and there was a tramway linking the clay pits there with the brickworks. Glebe Road passed over it on a bridge. I shall go back with my camera and see it I can make any discoveries. The house in the brickworks photograph must be in Bellfields Lane and should make it possible to take 'then and now' photographs. The recreation ground on Glebe Road, incidentally, includes a skate park, which opened in about 1977 when the craze first hit Britain. A Facebook group devoted to Market Harborough talks about remembering when you could go fishing in Bricky Tip, but that is before even my time. The essay which accompanies the map says that the brickworks itself had closed by 1907, when the urban district council established the recreation ground there. I have heard it said that bricks from Little Bowden were used to build St Pancras, but then that story is told about every brickworks in the East Midlands. Given the size of the old pile, these local legends may all be true. Lib Dem party members Richard Nixon and Gary Johnson with a banner they unfurled at a recent council meeting to show their anger at Mr Poole's defection, outside Pittwood House in Scunthorpe. Young, innocent and exposed to the wiles of old Europe, Scott Walker resembled a Henry James hero. He first came to prominence as a member of the Walker Brothers, a band manufactured in America (they were not brothers and none of them was originally called Walker) to succeed on the other side of the Atlantic. He later emerged as a considerable artist in his own right. He was known for popularising the songs of Jacques Brel to the English-speaking world (we heard him singing Jackie in one of my first Sunday music choices), but he also composed many songs of his own. This, which blends his wonderful voice and a lovely melody with difficult, elliptical words, is a good example of his own work from the 1960s. I had it mind to write a post moaning about an article in this morning's Guardian. It was an account of Jonathan Ross's farewell to the BBC by Zoe Williams. Of course, any event in which David Beckham takes part, and speaks for a period of time, and appears to be enjoying himself, or at the very least, not in hell, that's news, right? Why does a 37-year-old educated at Godolphin & Latymer School and Lincoln College, Oxford, feel the need to write like that? Why is she allowed to do so on the news pages of a national newspaper? The band, the piano, the poofs, all the furniture had started to look a bit old-fashioned, a bit Royal Variety performance. But the format wasn't broke, and nobody's even fixed it. We've just stamped on it and made a mess. And in due course, it will reappear on ITV, still not broken, and hopefully we'll have more sense next time. The band, the piano, the poofs, all the furniture had started to look a bit old-fashioned, a bit Royal Variety performance (who invented the musical interlude? Logie Baird?). But actually, the format wasn't broke, and nobody's even fixed it. We've just stamped on it and made a mess. And in due course, it will reappear on ITV. It doesn't do to get mawkish – it's not the end of the world, certainly not for Ross, who is generally thought to feed on adversity and get a bit lazy in good times. But it's hard to shake the feeling that he was cut down for no good reason, just for the insult of his riotous, unstoppable thriving. I wonder how often the Guardian does this? There is nothing sinister in it, but it is striking that it is the web version that carries Williams' more considered thoughts and the printed version that was apparently written in haste and later thought better of. The new, web-based conclusion is a bit more sensible, but surely the reason for Ross's behaviour, beyond his own graceless behaviour, is that the changed economic situation means people are less likely to tolerate paying someone £6m a year just for being a cheeky chappie. You'd think someone who fancies herself as a political pundit would have thought of that. Andy Crick has a major problem with the coalition government: "My problem is that, notwithstanding some of the measures in the budget, like the dodging of a meaningful capital gains tax increase, I find myself agreeing wholeheartedly with much of what is being done. This is a difficult position to be in when I want to maintain my independence and critical faculties." If you missed Zac Goldsmith's extraordinary performance on Channel 4 News last night, hurry over to Caron's Musings for the video and some sensible comment. Another fount of good sense, The Wartime Housewife, strikes a blow against Outnumberedism. 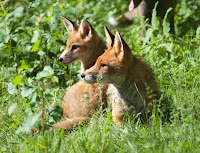 She is looking forward to the school holidays and seeing more of her children. BLDGBLOG has a photograph of the 18th-century ship that has been discovered during building work on the site of the World Trade Center. More prosaically, Diamond Geezer looks at the 80-year history of Green Line Coaches. Mind you, I can recall, when a little boy in Hemel Hempstead, being amazed that it was possible to catch one all the way to somewhere exotic like East Grinstead. 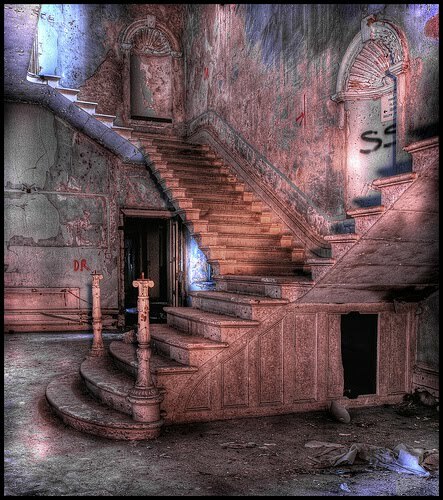 Sick Britain has some atmospheric photographs of abandoned asylums, one of which I have borrowed and used here. It is worth quoting Enoch Powell's words from 1961: "There they stand, isolated, majestic, imperious, brooded over by the gigantic water-tower and chimney combined, rising unmistakable and daunting out of the countryside - the asylums which our forefathers built with such immense solidity to express the notions of their day." I have visited Gaddesby twice before. The more recent occasion, though it is some years ago now, was to play chess for the Leicestershire in the village hall here. We played most of our home games in the old Leicester City Council staff social club, but for some reason we played our match against Nottinghamshire here. The hall took some finding today. It is a modern - perhaps 1960s - building on the outskirts of the village. I had no memory of it, but for once I have a clear memory of the game I played there. I was Black in a Modern Defence and the game was a short and violent draw. Afterwards my opponent and I played over it again, both rather pleased at how clever we had been. The first time I came to Gaddesby was at the height of my interest in local political history. I wanted to see something that was inside the church. I shall show you that in a day or two, but the point of this posting is the church itself. The Decorated west end of the south aisle appears to have been designed at the end of a riotous 14th-century party. It is one of the most eccentric compositions on any English church. 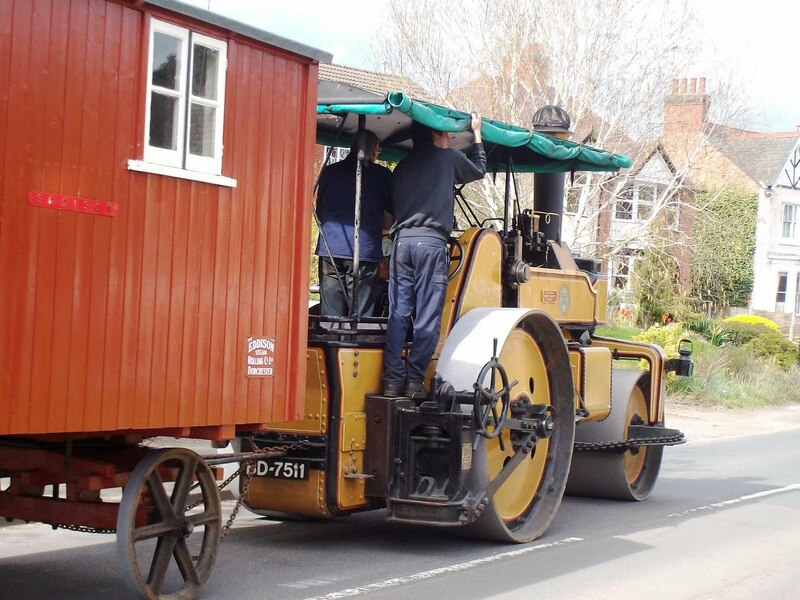 What is it doing in an obscure Leicestershire village? A history of the church, written by Ernest Smith in 1968, gives two reasons. The first is that in the 14th century Gaddesby was a significant market settlement in the most prosperous part of one of England's most populous counties. As rectors there is no reason why they should have been responsible for the work in the aisles. But let's ignore that, because the Knights Templar are good box office. I intend to write a novel mixing up the suggestion that the Holy Grail is buried here somewhere with speculation about the survival of members of the family of Tsar Nichloas II and the real reason the Titanic sank so quickly. So enjoy Gaddesby while it is still obscure. Zac Goldsmith was on Channel 4 News earlier this evening to answer questions about his election expenses for the Richmond Park constituency at the general election. He gained the seat from Susan Kramer and the Liberal Democrats in a closely fought contest. If you missed it you should watch the video of his encounter with Jon Snow. There is some background on the Channel 4 News website. This week's acting editor of Liberal Democrat News was Adrian Slade - the man who auditioned Peter Cook for the Cambridge Footlights. Whenever he Adrian takes charge I feel under great pressure to be funny. As I couldn't think of any witty lines of my own, I decided to review Best Seat in the House so that I could steal someone else's. Frank Johnson, who edited the Spectator and wrote the Daily Telegraph’s parliamentary sketch for many years, died in 2006. 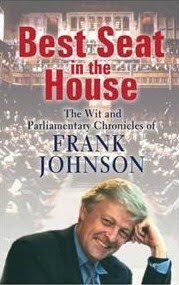 A collection of his journalism – Best Seat in the House – edited by his widow Virginia Fraser was published by JR Books last year. It is still available and certainly worthy of review. Johnson, as everyone agreed when paying tribute to him after his early death, was witty but never vicious or nasty. His victims did not take offence. Best Seat in the House also reflects Johnson’s love of opera, and this enthusiasm provides the best story in the book. It happened that his Shoreditch school traditionally provided the urchins for performances at Covent Garden, and at the age of 14 he played one of Maria Callas’s children in Norma. Howard's cartoon from today's Liberal Democrat News (click to enlarge). The Brampton Valley Way - which occupies the trackbed of the old Market Harborough to Northampton railway - has a blog devoted to it. Another newsreel from British Pathé. St Mary's stood on the District Line between Aldgate East and Whitechapel. It opened in 1884 and closed in 1938, later being used as a public bomb shelter during the war. on 22 October 1940 the surface building was hit by a bomb and severely damaged. It was subsequently demolished and little evidence of the station's existence appears above ground today. The bricked-up platforms are still accessible to London Underground staff via an anonymous door off Whitechapel Road. David Leboff has gone through that anonymous door to make a film about the station for the BBC. A Channel 4 News investigation has raised questions over the election expenses of Conservative MP Zac Goldsmith in the Richmond Park constituency that he gained from Susan Kramer and the Liberal Democrats in this year's general election. The report will be on Channel 4 at 7.30 p.m. - and no doubt on the web after that. Both the Conservative MP for Harborough Edward Garnier (Solicitor General, no less) and Liberal Democrat councillors in Market Harborough are campaigning against closure of the town's magistrates court. Are they all supporting spending cuts at a national level and opposing them locally? There is something of that, certainly. But I think there is more to it than that. As far the coalition has a shared ideology, it is a scepticism about big, centralised solutions. So it is legitimate to ask whether moving every trial to Leicester will save money and whether doing so will meet the need for justice to be seen to be done. My former headmaster did famously fall asleep on the Bench at Harborough court once, but I still support local justice for local people. A Lib-Lab coalition in Scotland? Ah, but they can and, given half a chance, they almost certainly will and here is why. it might be worth thinking about the following: Iain Gray as First Minister, Tavish Scott as his Deputy, Nicola Sturgeon as Leader of the Opposition and the Tories in post-election meltdown trying to choose a new leader. 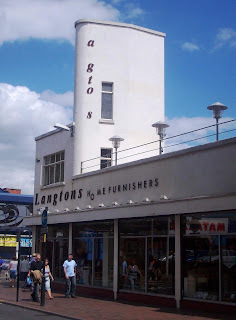 Langton's in Church Gate is a good furniture shop, but the building has seen better days. In fact it now resembles Reginald Perrin's employer Sunshine Desserts. Finally on the east side of Church Gate, the premises occupied by Langton’s (81 Church Gate) at the corner of Gravel Street are of interest. They were built as a garage (Castle’s Motors) in the 1930s, probably at the time when Gravel Street was extended. 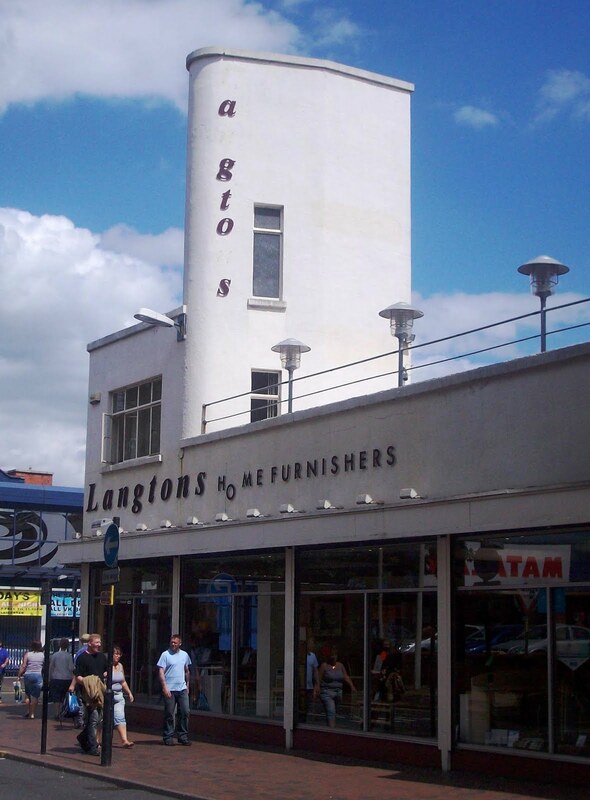 It is in Art deco style – popular for such uses at that time - and features a tower that acts as a prominent local landmark. Shot between 1962 and 1986, Tarkovsky’s seven feature films often grapple with metaphysical and spiritual themes, using a distinctive cinematic style. Long takes, slow pacing and metaphorical imagery – they all figure into the archetypical Tarkovsky film. Whatever that last phrase means. You can find a short analysis of each film at Strictly Film School, so get the buckets of popcorn in and have yourself a treat. Writing on Liberal Democrat Voice, Mark Pack detects Paul Burstow's hand in the new NHS white paper. Disgruntled Radical has the text of the motion on Trident that has been submitted to the party's conference committee. The Court of Appeal's decision to quash the Welsh Assembly Government's order to carry out a badger cull in North Pembrokeshire is welcomed by Peter Black. At Huffington Post Keli Goff looks at the Mel Gibson and Roman Polanski cases and concludes: "I guess the silver lining for abusers everywhere is that it looks like unless you use a racial slur while committing abuse you might be okay, career wise." 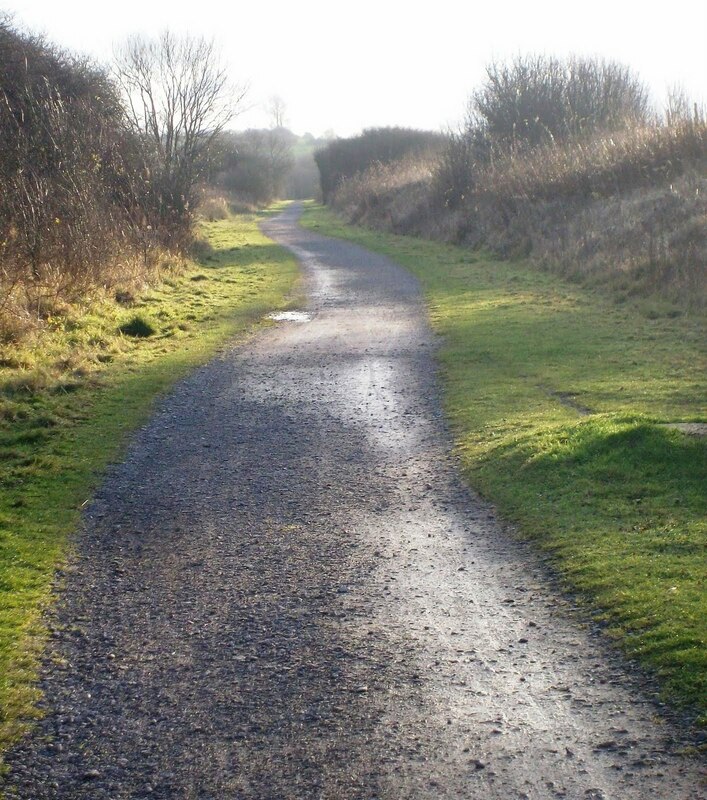 The author of the classical music blog On An Overgrown Path saves a boy from drowning off the Suffolk coast. The parallels with Peter Grimes are not lost on him. Wartime Housewife, as everyone should at least once in their lives, visits the Sunday antiques market in Market Harborough. 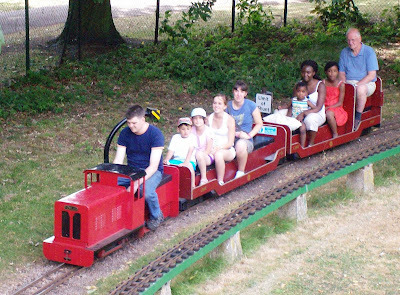 As well as two sets of ruins and the statue of Cardinal Wolsey, Leicester's Abbey Park contains a miniature railway. According to the page of the Leicester Society of Model Engineers, whose headquarters by the railway occupy a more impressive building than you find on most country stations, the line has a ground level railway in Abbey Park catering for 7 ¼” and 5” gauges and a raised track catering for 5”, 3 1/2”, 2 ½” and 1¼" gauges. 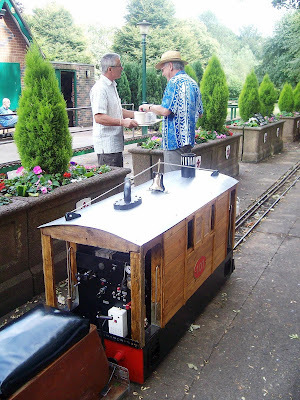 The railway at Coate Water, Swindon, is also 5" gauge. Note that the Abbey Park line recognises the importance of tea to English leisure activities. "Segway driver becomes first prosecuted in Britain", says the Daily Telegraph. Richard Grayson has written a for Compass, a campaign group essentially concerned with returning the Labour Party to its pre=Blair values. You can find a shortened version in the New Statesman, and David Boyle has written a sympathetic critique of that article. Meanwhile, the public are unlikely to be enthusiastic when faced with an overall record of running down the state to the levels that made voters so willing to embrace New Labour in 1997 after nearly two decades of slash and burn. During Margaret Thatcher’s premiership public spending grew in real terms by an average of 1.1% a year, while during John Major’s premiership it grew by an average of 2.4% a year. The fact that such increases feel like a policy of slash and burn to social liberals suggests that there is a problem with their views. As I have argued before, they need to think harder, not about their differences for the Conservatives, but about what differentiates social liberalism from socialism. Tony Greaves: "It really is appalling"
Pendle-based Lord Tony Greaves is the first major Lib Dem politician to break ranks with his party because of the initiatives and policies being introduced by the Conservative/Lib Dem pact. 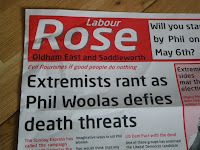 He is particululary unhappy at policies in relation to education, health and cuts to local services. Lord Greaves, who lives in Winewall, near Colne, has written a weekly column in the Lancashire Telegraph for more than six years. Later. For the sake of clarity, I had better add that I posted this because I thought my readers would be interested to know what Tony has said, not because I agree with him. Many thanks to the reader who put me on to this British Transport Film from 1955. A group of CTC members take the train from London to Rugby and then go on a ride. Sensibly, they head towards Market Harborough, so there are shots of Husbands Bosworth, Foxton Locks and the Battle of Naseby monument. The Liberal Democrat deputy leader, Simon Hughes, today distanced his party from education secretary Michael Gove over the contentious decision to cancel 700 school rebuilding projects. Hughes said he was not entirely comfortable with the handling of the announcement, adding it would be "a nonsense" to build the new free schools proposed by Gove using cash that could have improved existing buildings. claimed Patrick Wintour in this morning's Guardian. I don't suppose anyone is "entirely comfortable" with the handling of the announcement - certainly not Gove himself. But I am not convinced that Simon Hughes can single-handedly distance the party from anything. And, more important, I do not see why it would be a nonsense to build new schools with cash that could have been used to improve impressive buildings. If existing schools are decrepit then, of course, improving them should come first. But, as I have pointed out before, it is by no means clear that all the new schools being provided under the Building Schools for the Future programme are needed for this reason. Nor, where urgent replacement is needed, is it clear that this programme offers the most cost-effective way of doing so. Beyond that, one of the reasons I am a Liberal rather than a socialist is that I want to see variety and innovation in the public sector. So I am find it hard to be concerned that money is going to set up new schools. And, much as we all love Simon , I have a limited appetite for hearing those who were privately educated themselves insist upon conformity in the public sector. I remain devoted to the British Pathé website. This newsreel has shots of Oakham, Uppingham and Manton from 1944. 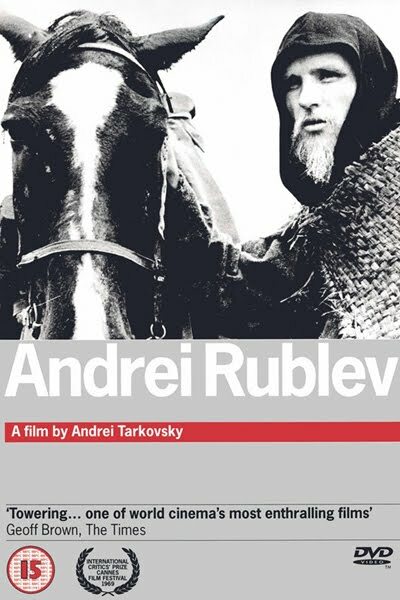 As ever, click on the picture to go to the film. Writing in the Observer, Henry Porter praises the coalition government: "Despite George Osborne's budget, despite what we know is coming down the pike in the way of spending cuts, unemployment, the erosion of pensions and the possibility of a deeper recession, the coalition is popular, or at least tolerated, because the daily exercise of power seems more humane, reasonable and commonsensical than at any time during the last five years under Tony Blair and Gordon Brown." But how, asks The Devil's Knife, will people be able to vote for the coalition at the next election if they share Porter's enthusiasm? The comments suggests possible answers. Les Bonner quotes Norman Baker on his ambition to be "the first virtual transport minister". "You're sipping a cold beer on a hot summers evening seated outside a bar in a beautiful cobbled medieval street surrounded by marvellous ancient buildings. Brugge? Ghent? Vienna? Munich? Well yes, but what if this could be in cosy old Leicester?" Only in Leicester calls for the reopening of the Castle Inn within the bailey of the city's Norman castle. 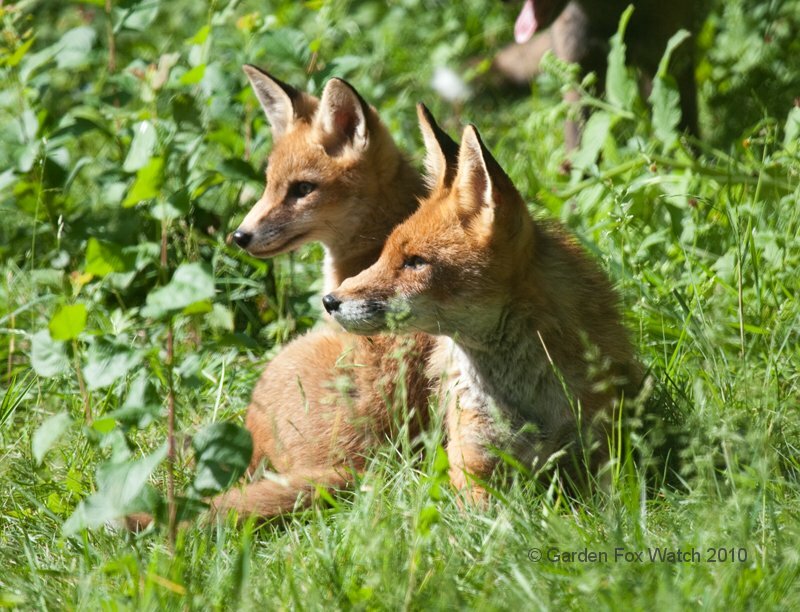 Foxy Lady, the writer of Garden Fox Watch, reports that her cats are well able to show the fox cubs growing up the back garden who is boss. The photo above has been borrowed from this blog too. IanVisits takes us down to the spooky catacombs under West Norwood Cemetery in South London. CocoRosie's new LP Grey Oceans has evoked mixed reactions. Evidently there is something slightly magic going on. CocoRosie were good before, but now their exotic, unique charm is tempered with songwriting maturity. Grey Oceans gathers influences and instruments – nursery rhymes, electronica, choral music, hip hop, Indian strings, even a sample of their mother singing in Cherokee on the mournful, mumbled ‘Undertaker’ – into well-crafted, intensely evocative songs. For all their faults, the world is undoubtedly a richer place to have a group like CocoRosie out there doing what they do and getting modest attention for it. It's not damning that they engage with hiphop or affect old-timey mannerisms, it's that the results are so facile and fallow and precious. It's that their songs somehow manage to be both grating and yet so flimsy that they're barely even there. Well, I like this live performance of a track from the LP. The vocals are poised between Lisa Hennigan wholesomeness and Bjorkian kookiness. More about CocoRosie on Wikipedia. Port Vale 4 Ever has some photographs of this pre-season friendly -a notable day in the town's football history. Harborough Town used to be known as Market Harborough Town Imperials. Any spectator shouting "Give us an M" was banned for life. When Cardinal Wolsey fell from favour with Henry VIII over his failure to persuade the Vatican to annul the king's marriage to Catherine of Aragon, he lost all his titles accept Archbishop of York. Then he was accused of treason and summoned back to London. He died at the Abbey of Saint Mary de Pratis (also known as St Mary of the Meadows) outside Leicester on the journey south and was buried there. 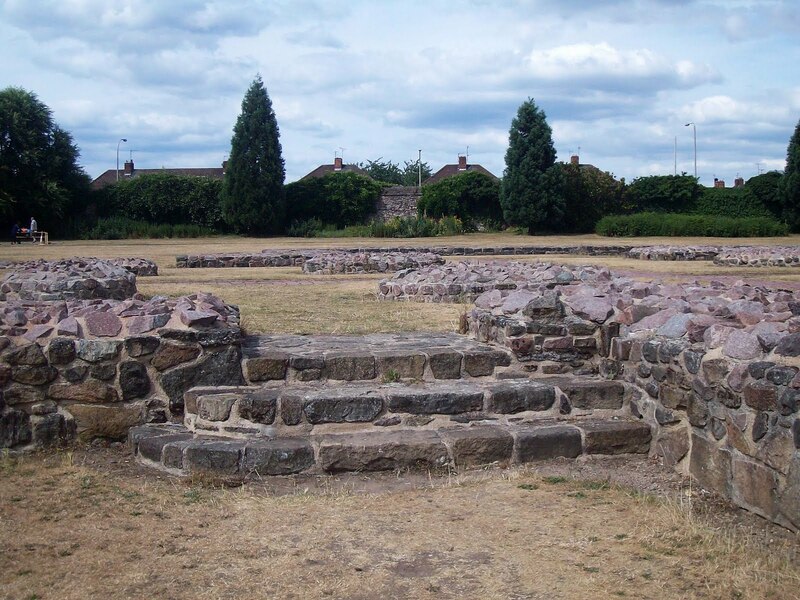 Today the abbey ruins give their name to Leicester's Abbey Park. Wolsey is commemorated by a statue (given by the Wolsey knitwear people), though he looks bemused to find himself outside the rather tawdry pavilion and cafe there. The Abbey ruins are a disappointment. They were lost for centuries after the dissolution of the monasteries and no original remains are to be found above ground level. What you see today are foot-high walls put up after excavation in the 1920s to show the abbey's original footprint, complete with a tomb for Wolsey. Given the rudimentary state of the discipline in those days, it is possible to wonder how much worth this recreation has. 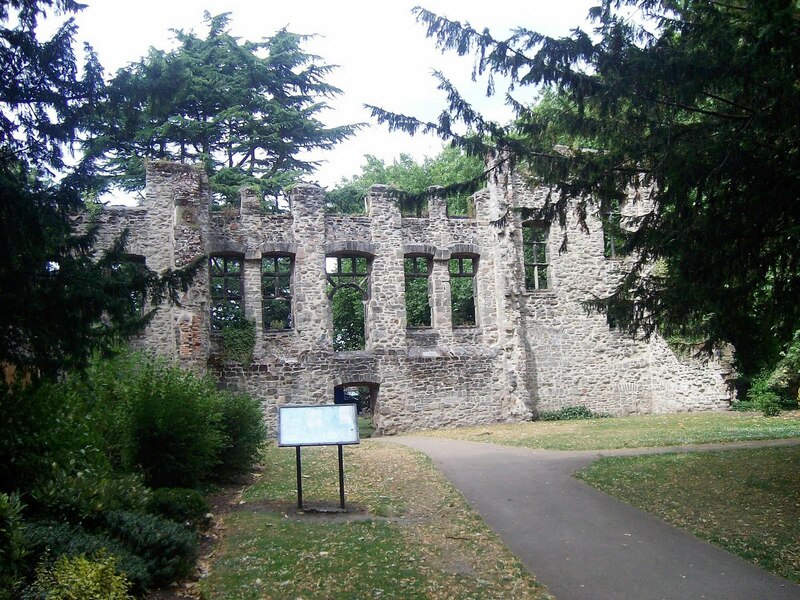 Nearby you will find the more substantial remains of Cavendish House, the main part of which has been ruinous since the Civil War. And the park also contains a picturesque stretch of the River Soar and a miniature railway. The latter is worth a posting of its own. Two thoughts about the drama in Rothbury last night. The first is the ridiculousness of the rolling news coverage from Sky and the BBC. They had little to report once it was known that had been found and was threatening to shoot himself. After that they were in the way, both metaphorically and literally. The parallel Stephen Tall draws between their coverage and The Day Today is instructive. I also have a lot of sympathy for Johann Hari's view that this level of coverage increases the risk of copycat killings. Every violent, inadequate individual now knows how to become a celebrity. Still, I did watch some of the coverage, so I suppose I was complicit in this folly. Secondly, and more encouragingly, I was impressed by the lengths the police went to in an attempt to stop Moat killing himself. Here was a man who had murdered one person and tried to kill two more, one of them a police officer. Yet they tried to talk him out of shooting himself. I have always been struck by the contrast between two hostage events that took place in my younger day. In 1975 four IRA men were cornered in a flat in Balcombe Street in Marylebone and took its two occupants as hostages. The siege lasted six days and eventually the men gave themselves up and nobody was harmed. This, we liked to think in 1975, is how we did things in Britain. We were not trigger-happy like the Americans. Fast forward to 1980 and things looked rather different. Then the siege of the Iranian Embassy was ended by an SAS assault in which one of the hostages and five of the six Iranian gunmen were killed. Two more hostages were injured in the cross-fire. These two hostage incidents were perhaps not comparable, but the way the SAS were lauded in the subsequent days suggested that the British were starting to see themselves in a very different way. This reaction was symptomatic of the coarsening of our national life that took place over the Thatcher years. The Iranian Embassy siege may also marked the start of rolling news coverage - they even interrupted the snooker (no small step in 1980) to show us the conclusion. 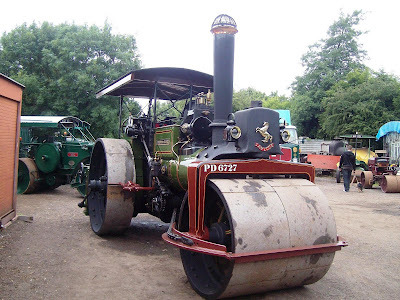 If events at Rothbury suggests that there is still validity in the Balcombe Street view of how we do things in Britain, then I am encouraged.